Normally I keep my private detective cases confidential. This one is an exception. But The Atlas Pursuit is more than just a detective story … you get to solve this mystery yourself. You’re going to have to travel to places in New York City to figure everything out. Make sure to bring an internet-connected device with you — a smartphone at least, a tablet or laptop even better. Also, please don’t be that guy. The Atlas Pursuit has a lot for you to figure out for yourself. Feel free to work with other people to solve it all. But once you figure things out, please keep everything to yourself. Please don’t tell your friends the answers, or post solutions on Facebook or Twitter, or upload pictures and clues on Instagram or your blog. That would ruin other people’s chance to solve it for themselves. It sounds like the beginning of a Dashiell Hammett novel — my phone rang and on the other end was a Hollywood bombshell who needed my help solving a mystery involving her famous writer husband. Granted, she was a few decades past her prime. But in her day Patricia Neal was one of the hottest actresses on the silver screen. So you can imagine my surprise when she called, looking for my help. I’ll admit I was starstruck, and more than a little curious why she was calling. I found out when she arrived at my apartment later that day with a battered wooden box and one helluva story. I guess you could call me a private detective, but not in the traditional sense. I don’t go chasing after philandering husbands or missing relatives. This case started with that phone call back in the spring of 2009. It was a Friday morning, and I hadn’t left yet for my paper-pushing job at a Midtown office building. That job had nothing to do with my private eye work, but it was consistent and paid the bills in a way my detective work didn’t. I was in my spare Upper East Side apartment, so far east it was practically in the river. It was unusual for my phone to ring so early in the morning. The voice on the other end was breathless and nervous. I was kidding. I didn’t expect that the Patricia Neal was calling. But then I connected the gravelly voice on the line with those old movies, like Hud and Breakfast at Tiffany’s, and I realized that it was, in fact, her. “It is. I mean, I live alone, but my apartment is small. Wouldn’t you prefer a coffeeshop or something?” It was true that I lived alone, but my boyfriend had stayed over the night before and was asleep in the bedroom. He slept right through the phone call. “Okay. Privacy. Got it.” I gave her my address. By some coincidence, we only lived a few blocks away from each other, though those were the blocks that separated the movie stars from the hoi polloi. I called out of work with an imaginary cold that fooled no one. I woke my boyfriend and chased him out of the apartment with no explanation. He was confused, but obliged. Then I set to cleaning my apartment as fast as I could. It’s probably best that I didn’t have too much time to worry about my clothes. What do you wear when a movie star is coming to your apartment? I decided neutral was best — a button down blue shirt and tan chinos. I was aiming for something professional and trustworthy but not too formal. 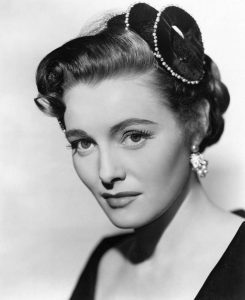 I also read up a bit about Patricia Neal online. Not many men in their 30s would have already known even a little bit about Patricia Neal. All the times as a kid that I stayed inside watching old movies instead of playing outside was finally paying off. 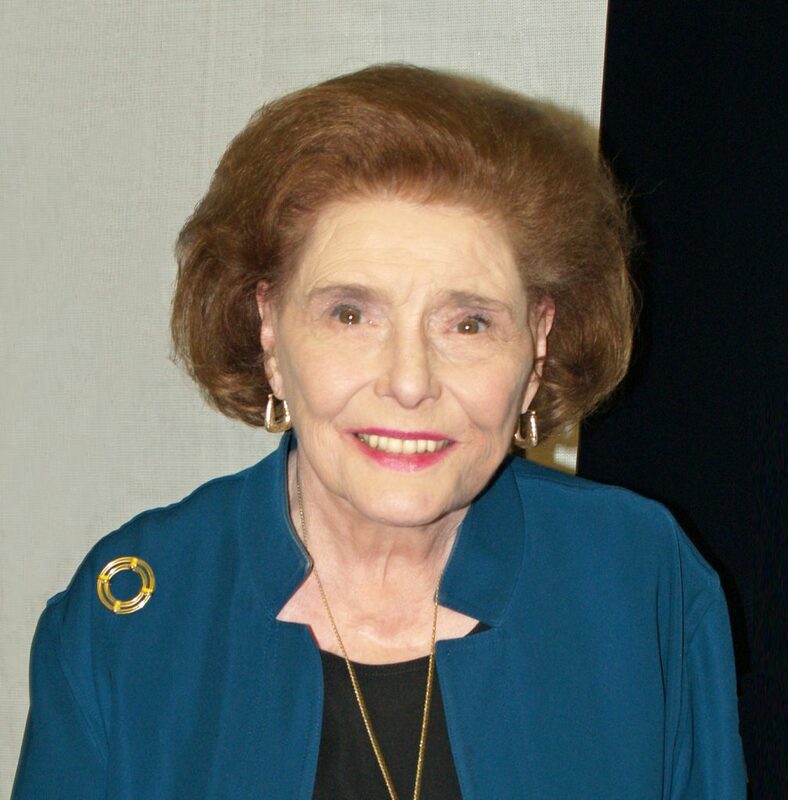 I knew she was a famous, Oscar-winning actress, and somewhere in the back of my mind recalled hearing about a miraculous comeback from an almost-fatal stroke in the middle of her career. I didn’t know about her love affair with Gary Cooper, or that she was married to Roald Dahl, the famous writer of children’s books. But that’s about the extent of what I was able to find out before my buzzer rang. I pressed the button to let her in. I did a last sweep of the apartment making sure I had shoved all of the dirty clothes and piles of papers into the closet. I did one final wipe down of my tiny table and even tinier counter. A while passed and there was still no knock on the door. Then the buzzer rang again. “Come on in,” I said over the intercom. “I’ll be right down.” I ran down the stairs — just a couple of flights, but with no elevator as an alternative. At the bottom of the stairs was a slightly hunched older woman. One hand held a cane, and the other a rolling suitcase. She took hold of the banister with one hand and my arm with the other. I carried the suitcase and her cane with my free hand. It took a little while and a lot of effort, but finally, out of breath, she was seated at my little table. A few minutes and a glass of water later, she was ready to talk. Handsome, I guess, is the best way to describe her. I could tell from her sharp features that in her day she was quite striking. She showed almost no symptoms from the stroke that 40 years earlier had left her speechless and immobile. Despite having left the South long ago, she still had the strange mix of formality and what my people would call chutzpah, though I imagine her people would call it gumption. She was smartly dressed in a light purple blazer and black slacks. She moved and talked slowly, but mentally she was sharp. She reminded me of my grandmother. I had always chalked up my grandmother’s demeanor and directness to being a Brooklyn Jew, but evidently these qualities are more universal. The similarities between my guest and my grandmother put me at ease. But this was a miscalculation on my part, because my grandmother is always happy to see me. Ms. Neal disliked me from the minute she stepped into my apartment. “I don’t even know what we’re talking about,” I said. “So why don’t you just tell me about it?” I had said the wrong thing. She laughed, saying, “You have me pegged all wrong, Mr. Wise. I’ve spent many years living in a convent, in a room far more humble than this.” With more time, I would have done more thorough research and known this. “We divorced a long time ago. But I recently received a letter from a bank, saying that the branch was closing and that my safe deposit box would need to be relocated. I vaguely remembered purchasing a safe deposit box around when Roald and I were married, though I really hadn’t thought about it since then. But the safe deposit box was in my name, and Roald has been dead for a number of years. “You should know, Mr. Wise, that I am not a pack-rat. I was never one of those actresses who held on to all of her Hollywood momentos. But like everyone, I have a junk drawer, and inside was a key. For the longest time I couldn’t remember what that key opened. When I received the letter about the safe deposit box, I thought maybe that’s it. So I took the key and went to the bank. And sure enough. I couldn’t help but glance at the battered suitcase I had just carried up to my apartment. Were the contents of the safe deposit box inside? I certainly had. All those things that made me a peculiar kid, like being a history buff, were now coming in handy as a historical sleuth. Much has been written about William Stephenson, including the claim that his efforts shortened World War II by years. Stephenson had almost single-handedly brought intelligence work to the U.S. as the head of an organization called British Security Coordination (BSC). That organization was a precursor of sorts to the CIA. I told Patricia Neal all of this. “Roald wasn’t entirely forthcoming, but he said he felt that Bill hadn’t told him everything that happened during the war. This was a problem for Roald, since Bill had asked Roald to write the history of everything BSC had done. If Bill wasn’t going to be fully honest with him, how could Roald complete the project? So he bowed out. Roald never lost respect for Bill, but this put a damper on their relationship that lasted until that night when Bill came to our apartment for dinner with the most unusual wedding present ever given. “I was 27, and newly married. Hollywood hadn’t exactly prepared me for the job of housewife. 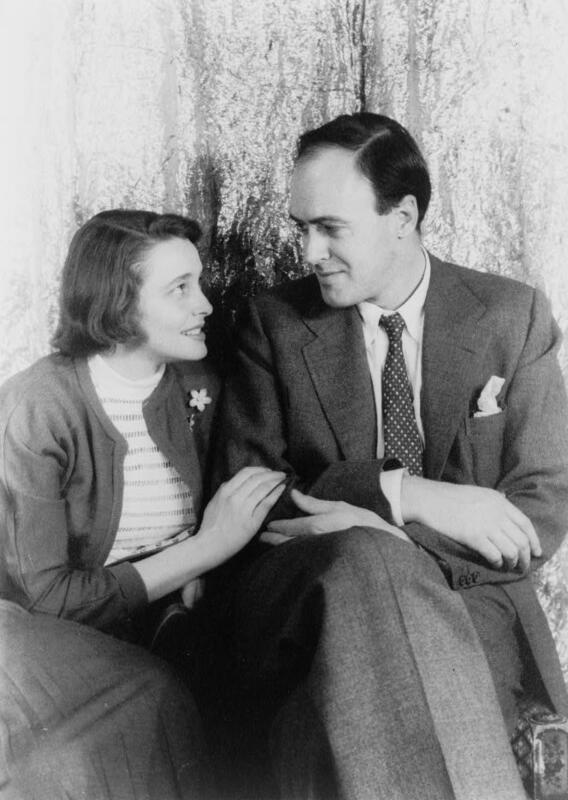 And being a housewife to Roald Dahl was more difficult than it might have been with other men. I was trying to adapt to the role, but the task was daunting. But I was doing my best that first night Bill came to our apartment for dinner — I cooked, I mixed martinis, and I left the men alone to talk about old times. Or, at least, that’s what they thought. “Roald had filled me in on who our guest was. Naturally, I was curious what would bring this celebrated and mysterious war hero to our home. I suspected it was more than a social call, or to give his regards to the newlyweds. So I did my best to be unobtrusive, fluttering in and out of the room to check on the dinner, but all the time I was keeping an ear on what the men were discussing. My acting skills evidently paid off, since from what I could tell they spoke openly that night about old times, the war, and those wooden boxes that Bill brought as a wedding present. “Bill started off with an apology. He said that Roald had been correct back in 1945 — there was a secret that could not be recorded in the history of BSC Roald had been assigned to write. Even in 1953, the higher-ups in London believed the secret too explosive to share publicly. But Bill felt that Roald deserved to know the secret, to understand why he had put Roald in such an uncomfortable position back in 1945. That is where the wooden boxes came in. “At this point in the evening, Bill handed the biggest wooden box to Roald, wishing him all the best on his marriage. ‘That goes for you also, Pat,’ he said. I poked my head into the room, pretending the sound of my name had drawn my attention. My eyes were practically burning a hole in that old suitcase Patricia Neal had brought to my apartment. We sat in silence for what felt like an eternity, her sizing me up. Finally, she unzipped the suitcase and lifted out a wooden box. I wanted to reach out and grab it as quickly as possible before she changed her mind, but I restrained myself: it was important for her to give it to me, rather than me taking it from her. When I finally had the battered box in my hands, I unhooked the metal latch holding the box closed, lifted the cover, and found myself staring at what looked like an old-fashioned typewriter, but with a full set of letters above the keyboard and a space above that with three gears. On the front side of the machine was another set of letters with little holes corresponding to each letter. The Enigma machine probably requires no explanation. 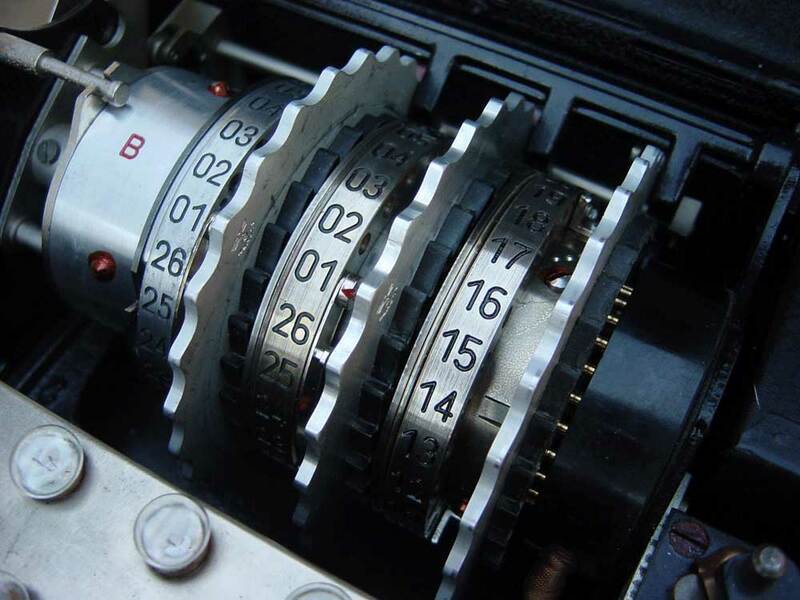 It may be the most famous device for deciphering encrypted text in history. 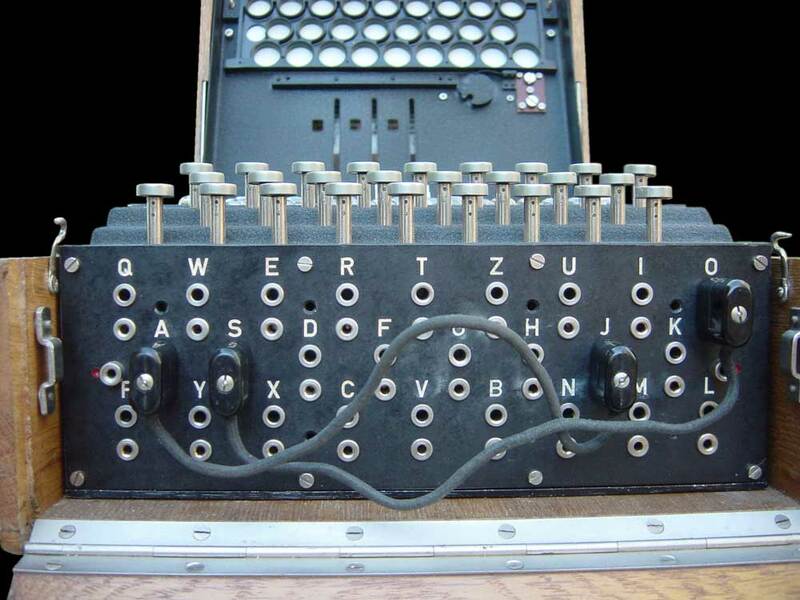 The German army used Enigma machines to encode messages during World War II. The Germans believed that the messages they sent using Enigma could not be deciphered by the Allies. 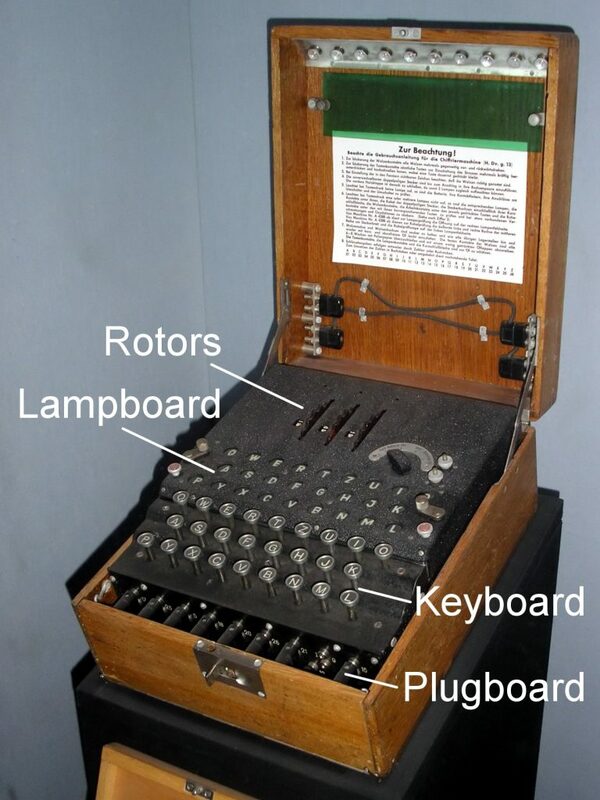 When the British successfully cracked Enigma, the advantage for the Allies was pivotal. I later learned that, while William Stephenson and BSC were not directly involved with breaking the Enigma codes, they were deeply interested in the most secure ways to send messages. The need to communicate with Britain and Washington from BSC headquarters in New York was vital to the operation, so much so that Stephenson oversaw the development of BSC’s own enciphering system that was used during World War II and for many years after. 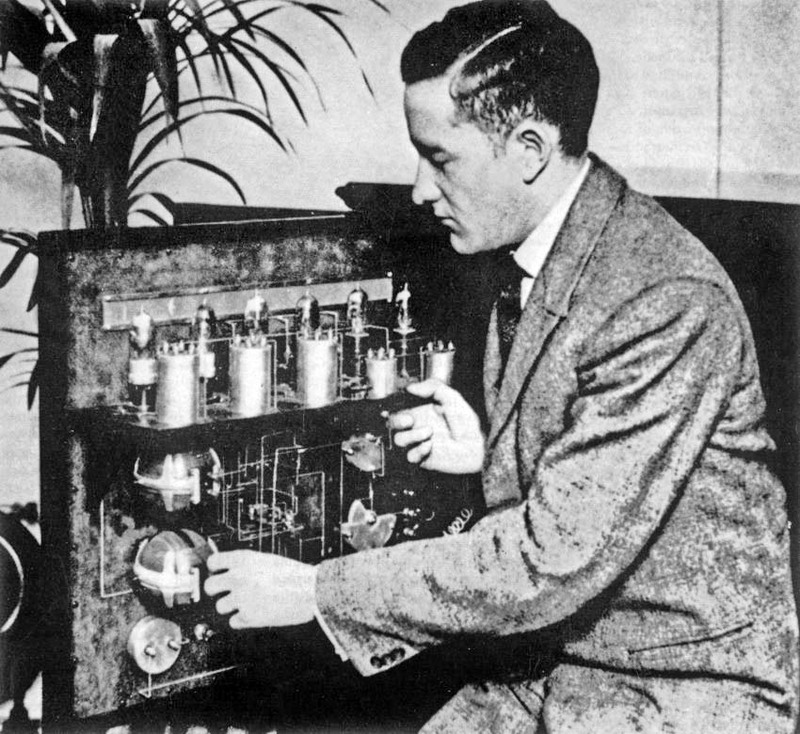 BSC’s enciphering systems were never cracked during the war, which is probably why they are less well-known today than Enigma. Roald Dahl wasn’t the only one who was awestruck at the opportunity to get his hands on an Enigma machine. I didn’t have as personal an attachment to the Enigma machine as he did, but I was definitely not expecting to have one show up at my apartment. The machine itself was surprisingly well-preserved, considering its age. I wasn’t sure if it still worked. But evidently the years spent in a bank vault had protected it from damage. “I can see that you are fascinated by this machine,” Ms. Neal said to me as I gently touched its keys. “Mr. Wise,” I corrected her. She was taken aback for a second, until my smile told her I was joking. I was starting to see why Pat had come to me, considering my work on the Central Park Papers. We then discussed money, the details of which I will omit. Somehow it feels unseemly to discuss our monetary arrangement. I’ll just say that I found her offer more than generous. “No. What I need from you involves the rest of Bill’s gift.” Pat reached into the suitcase and pulled out three sheets of old, yellowed paper. “You see, this machine was only part of the wedding present Bill brought that first day he came to our apartment. These papers were the other part.” And with that, Pat resumed telling me about Stephenson’s conversation with Roald back in 1953. “ ‘An Enigma machine,’ Bill said, ‘would be useless without a message to decipher. On these pages are three actual messages we intercepted. They are not just any three messages. These are the most important messages we decoded during the war. In fact, the war may have ended quite differently if we had not intercepted these messages. The ramifications would have been catastrophic. “Bill leaned in and looked Roald straight in the eye. ‘Secrets like this are more dangerous as secrets. I’ve presented this as though I am quoting Stephenson. But it is actually what I recall Pat saying she remembered that Stephenson said decades earlier. How accurate is it? I have no idea. But I did see, first-hand, that Enigma machine, and the faded pages on which Stephenson wrote the three messages. Pat handed me the three pieces of papers. I unfolded the first page. The page was not what I was expecting. Most of it was taken up by four cryptic sets of verses — riddles, if you will. Each verse had a different heading: Rotor Order, Rotor Setting, Starting Position, and Plugboard Setting. Below the verses, though, was what I was looking for — I saw the words MESSAGE ONE. My eyes darted to the text below. I should have suspected as much. Why would Pat have needed my help if it was obvious what the papers said? This was a bombshell for me, more than Pat realized. But I had to put it aside for the moment and concentrate on this new case. It wasn’t my first time reading up on decryption methods, so it only took about half an hour to learn the basics. The challenge would be simplifying it for Pat, who was surprisingly content to sit patiently at my table while I researched. She got up at one point and looked around my apartment, but I think she was surprised at how little apartment there was to see. First, she examined my bookshelf. Then she freshened up in my bathroom, which I hoped was remotely clean. “As ready as I’ll ever be,” she said. This section is going to get a bit technical. I recommend powering through it, since the information is useful. Alternatively, skip here, where the Enigma settings are boiled down to one easy bolded paragraph. Either way, it may be helpful to revisit this section to really understand how the Enigma machine works. “Not all Enigma machines are the same. 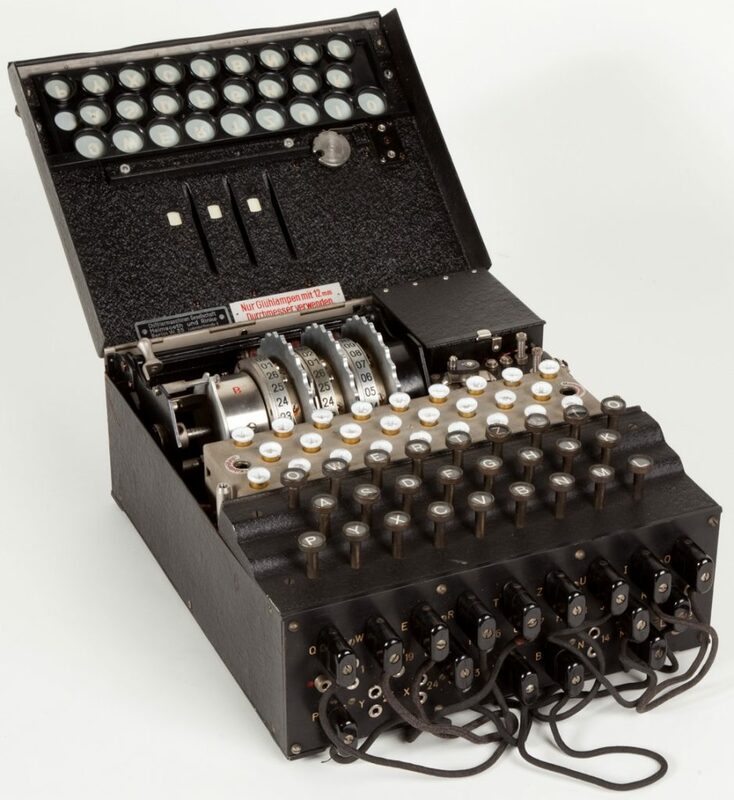 This one was known as Enigma I, or the Wehrmacht Enigma, which basically means that it uses one reflector, three rotors, and has a plugboard in the front. Don’t worry, I’m going to explain all of those things to you. “How does it change?” Pat asked. “First, you can use a different reflector, which alters the path of the current.” I lifted the hinged top of the machine and showed Pat the reflector and rotors underneath. An Enigma machine with the cover open. The metal cylinder with the red B is the reflector. The three numbered wheels are the rotors. “Wait.” Pat said. “There is something else I need to show you.” Pat went into the suitcase and pulled out another smaller wooden box. I recognized it immediately. I had just seen photos of boxes like it online. I opened the box and looked inside. “These.” Pat pulled out a jumble of cables. Why was she giving me each item one at a time? Apparently she still wasn’t sure if she could trust me. I felt my impatience was justified, but I held my tongue. I just continued showing Pat how the Enigma machine worked, which was a lot easier now that I had all the parts. “Next are the rotors. The rotors also alter the path of the electric current, but they move every time you press a key. That’s why pressing the same key twice won’t make the same letter light up again.” I pulled the three small rotors to the right of the reflector out of the Enigma machine. “See how these rotors are marked with Roman numerals I, II, and III?” I pulled over the smaller wooden box. Box with the two extra rotors (rotors V and IV, as noted by the Roman numerals). “Why didn’t Bill do it the same way the Germans did?” Pat asked. “Good. 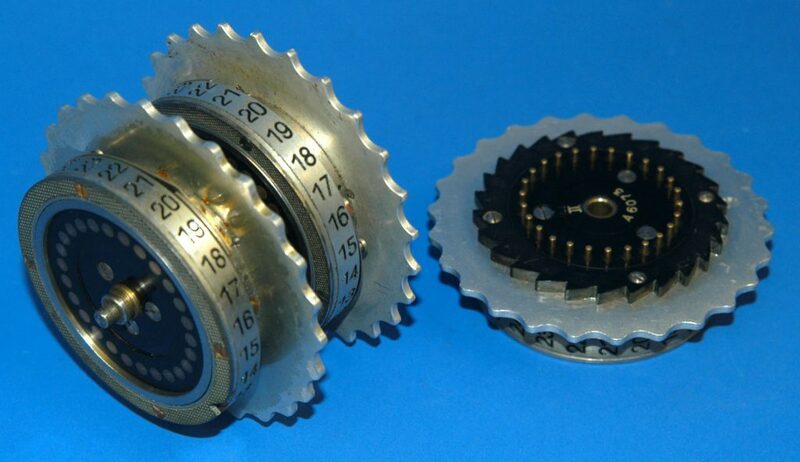 So we already know that the rotors need to go into the Enigma machine in the correct order. But before you put the rotors in place, you have to make sure they are calibrated correctly.” I picked up a rotor and showed Pat the numbers 1 through 26 in a circle on the inside of the rotor. I pointed out the little arrow on the side of the rotor. Close-up of the reflector and rotors. Note the arrow for the rotor setting on the middle rotor. “You are a natural at this. Then you close the cover. 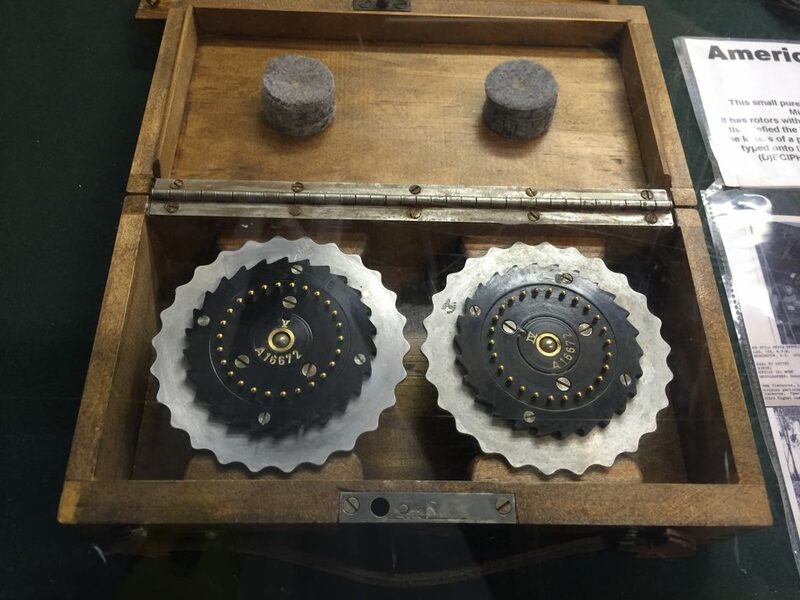 Once the front cover of the Enigma machine is closed, you can see one number — or letter — from each of the three rotors. Then the rotors can be rotated so that any of the numbers 1-26 — or letters A-Z — are visible. “Fine,” Pat said, doing her absolute best to follow along. “The last setting is what the Germans call the Steckerverbindungen, and Stephenson calls the Plugboard Setting. Basically this consists of all 26 letters arranged like a keyboard with holes underneath all of the letters. “This panel is called the Steckerbrett in German. These cables” — I held up the cables Pat had pulled out of the suitcase — “plug into the holes, and can connect any letter to one of the others. All, some, or none of these cables can be used. I thought that was clear enough, and Pat seemed to agree. “So where is the codebook?” Pat asked. “I’ll do my best.” Pat replied. “So, does this Enigma machine even work?” Pat asked. I wish I could report that the Enigma machine in my apartment sprang to life and began working when Pat hit that first key. But while 50 years in a bank vault had kept the machine in tip-top shape, the battery was dead. “Now what are we going to do? I don’t suppose you have a replacement battery for an Enigma machine lying around your apartment?” Pat asked. Pat sighed. Apparently there was, again, something she hadn’t told me. “David, you were not the first person I called after I emptied the safe deposit box. Once I realized what was in it, and that I wouldn’t be able to decipher the messages without help, I thought long and hard about who to contact. I wanted to be as discreet as possible, since I knew that whatever this involved, it was top secret. That much I distinctly remembered from when Bill came to the apartment. So I considered entrusting all of this to someone completely unconnected to the government, like you. But an old friend of mine has a son who works in the Intelligence Department, and in the end I decided to call him. His name is Jack Lester. I figured Jack would know how to help me. I finally called him last night, told him about what I had, and asked him not to take this up the Intelligence flagpole until we knew more about what specifically it involved. Jack lives in Washington D.C., so this was all over the phone. “There was something about that phone call with Jack that made me uncomfortable, and I was taken off-guard when he said that he would drive up to see me this morning. I started to wonder if calling him had been a mistake. I tried to put him off for a few days, but he kept insisting. I can’t quite put my finger on exactly why, but I started thinking that maybe someone in the government was exactly the wrong person to contact. “Still, what’s done was done, and I figured I had to just trust Jack. After all, I’ve known him since he was born. He visited us when he was a little boy. He used to run around that same apartment where Roald and I hosted Bill right after we were married. “Then this morning, I realized that I didn’t have any copies of the papers from the bank vault. I certainly wasn’t going to give Jack the originals. I wasn’t even sure I should give him copies, but I figured I should have some ready. So I packed everything into this suitcase and went to go make copies at a store down the street. “When I got back to my building, there were three very official-looking cars outside, and Jack was at the front door trying to get in. David, six men in uniform were with him. At that point I really regretted having called Jack. I had specifically asked him not to tell anyone about this, and he had done just that. Jack didn’t see me. So instead of going in, I went around the corner and went into an absolute panic about what to do. “Then I remembered about you, and Bill’s cryptic reference to Calvert Vaux’s Central Park codes. My neighbor always tells me about all sorts of crazy things he’s read or done. Normally, it barely registers. But a few years ago he told me how fascinated he was with the Central Park Papers. I thought to myself maybe that had to do with what Bill said that night in our apartment. I asked my neighbor for more information and he printed out a sheet of paper with your phone number. I put that paper with everything I had taken from the bank vault. So, as luck would have it, I had your phone number with me when I went out to make copies. I called you, and came straight here. “I assume it won’t be long before Jack and those men discover that I’m gone and I’ve taken everything with me. I need to get to the bottom of all of this before they find me. That didn’t exactly put my mind at ease. I wondered if I really knew what I was getting myself into. I had been so focused on convincing Pat that she could trust me. I never considered whether I could trust her. The more I thought about it, the more I realized that Pat’s life might be in danger. And now, so might mine. But it was too late to turn back. If this involved something top secret that the government was anxious to keep under wraps, I already knew too much. Despite the danger, my only option was to figure out what this was all about. “I hope there aren’t too many stairs. Are you sure we can’t figure this all out on your computer?” Pat asked. “I suppose you’re right,” Pat said, though the look on her face showed she was nervous. “I can tell you for sure that the first one is,” Pat said. I re-read the clue and realized she was right. “So you know where we need to go?” I asked her. She closed up the Enigma machine, put it in the suitcase, and headed for my front door. I thought it best not to argue with her. I just said, “Got it. Let’s go.” And off we went. I’m not going to reveal the decoded text of the first message. Stephenson didn’t make it easy for Roald, and neither of them made it easy for Pat and me. It’s far more fun and rewarding to figure it out for yourself. Below is a recreation of the page that Stephenson gave to Roald, complete with the encoded first message and the clues Stephenson gave Roald to decipher the message. I will give you a few advantages. First, just in case you don’t have an Enigma machine lying around, you can use an Enigma simulator to decode the message. Here is a link to an Enigma simulator I created. Truth be told, I didn’t create it from scratch — I just adapted it from a freeware simulator created by Daniel Palloks (who I don’t know). My version is easier for novices, English speakers, and mobile users who are reading The Atlas Pursuit. You don’t have to use mine — there are plenty of websites with Enigma simulators. Some that I have found particularly helpful are detailed here. But I think you’ll find mine more user-friendly. ~ Keep in mind what a potential solution to each clue could be. This page has that information summarized, or you can go back and read it in my discussion with Pat. ~ Bring an internet-connected device with you — a smartphone at least, a tablet or laptop even better. ~ Pen and paper come in handy also. If you need more help, go to the Help page. I have encrypted the rest of my description of my time with Pat, including the second and third messages and clues to decipher them. I have not used the Enigma to encipher these — they are far too long to use Enigma. Instead, I’ve used a modern-day password protection. The password is very simple — it is the first and last word of the decoded text of Message One, all lower-case, no spaces. The order they’d be read. A man in solemn prayer. Who almost killed us both. The password to open Part II of The Atlas Pursuit is the decoded first and last words of Message One, all in lower-case and without a space between the words. Copyright © 2017 David Wise.